Runners of all levels know that performance matters. Their own performance running through the streets, trails, and courses all across America matters to them – some more than others, depending on skill and competition levels. But of equal importance is the performance of their running attire. Of course, shoes are first and foremost here. Running puts tremendous strain on your feet and ankles, and the better and stronger your running shoes, the better your performance as a runner. But running attire matters quite a bit too. Particularly the performance of your running shorts. Here at Fit2Run, we understand the importance of quality running shorts as well as anyone. This is why strive to offer not only superior running shoes, but high-quality, high-performance, super-comfortable running shorts as well. Fit2Run designers created an exclusive brand, F2R, because we know fit. All running shorts, including F2R shorts, available in the Fit2Run online store are equal parts reliable, comfortable, and affordable. Our men’s running shorts offer superior comfort, excellent durability, and incomparable fit – all at an affordable price point that easily outshines those of competitors like Lululemon. Our best seller is the Men’s 5-Inch J-Slim Short. Complete with a 5-inch inseam slim fit, 4 pockets (two zippered), and a mock fly, these versatile slim-fit shorts also feature a super comfortable brief liner and reflective detailing on the sides (perfect for night runners). Available in an array of colors, fits, lengths, and subtle prints, the J-Slim Short is comparable to Lululemon’s Surge Short in many ways – except price. While the Lululemon Surge Short retails for $74, you can slide into a pair of J-Slim Shorts for just $32.99, on our official site. In other words, you can purchase TWO pairs of J-Slim Shorts for less than the cost of ONE pair of Surge Shorts. 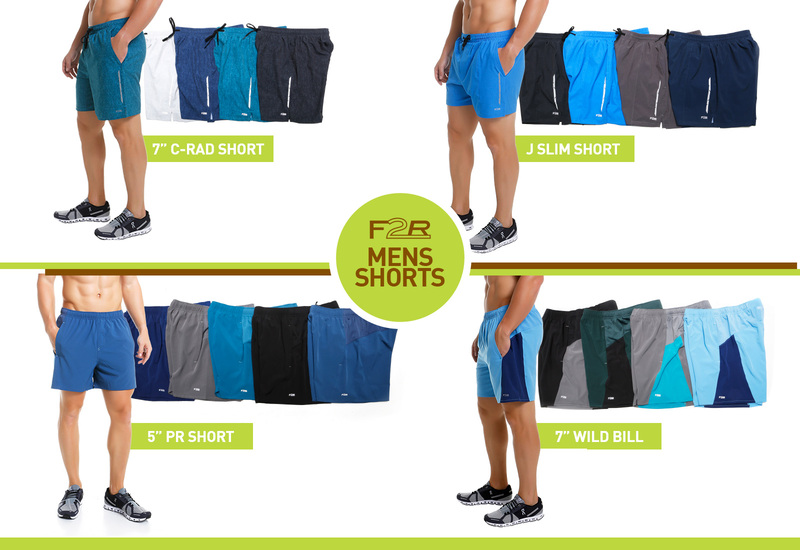 Another popular men’s running short at F2R is the Men’s 5-Inch PR Short. Featuring a 5-inch inseam loose fit, mesh panels, a draw-cord, hidden key pockets, built-in briefs, and reflective detailing, these shorts are available for just $29.99 at our secure online store. You may also enjoy our Men’s 7-Inch Wild Bill Short. Boasting a 7-inch inseam loose fit, moisture wicking, reflective detailing, mesh panels, and a hand pocket, this style also features a back zip pocket and is available for just $32.99. Or check out our Men’s 7-Inch C-Rad Short – complete with a 7-inch inseam slim fit, 2 hand pockets, 3 zipper pockets. There’s also no liner, making this style of short perfect for pairing with your compression gear. You can get your hands on a pair of C-Rad Shorts for just $42.99 right now. All orders over $69.99 placed at our online store ship for FREE, and when you place an online order on weekdays before 2 p.m. EST, your order will process the same day (orders placed after 2 p.m. process the next business day). If you’re a Club Fit2Run Member, you can enjoy FREE UPS standard ground shipping on orders over $29.99. Club Fit2Run Members also receive special pricing on all in-store and online merchandise, news about our special promotions, events, and new products, and other happenings at Fit2Run – all for just a yearly $30 membership fee. Established in 2006, family-owned Fit2Run offers a wide range of name-brand athletic walking and running footwear, technical running apparel, and accessories like performance eyewear, tech socks, and GPS wrist personal trainers. We pride ourselves on our strong community involvement and take great strides toward empowering athletes of all fitness levels to embrace a more active lifestyle. Voted “Best Running Shop” in the Southeast by Competitor Magazine readers, Fit2Run, The Runner’s Superstore, was created to assess and meet the specific and demanding needs of local runners and triathletes. Our trained and knowledgeable staff is committed to providing exceptional customer service – at every step of every runner’s journey.